Practice Area: Putting green that allows chipping. There is a driving range supposedly, but I've never seen it. It's apparently a good drive from the clubhouse. 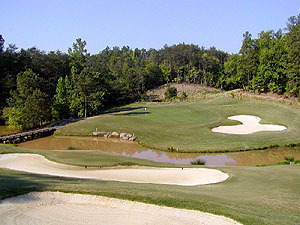 Description: Public course about 30 miles (45 minutes) from uptown Charlotte. The front 9 was the creation of Scottish-born Donald Ross and opened to the public in 1936. The back 9, designed by Tom Jackson, was completed in 1982. All 18 greens were redone in 2007-2008 and are now all bermuda. Notes: The course now has its own official website with online tee times available. Memberships available for less than $100 per month. Covers green fees. $10 annual handicap fee. B-Man's Take: This course is very reasonably priced, though the price has gone up about $5 from a few years ago. Good mix of easy and tough holes. Laid back atmosphere, usually maintains a good pace, though the locals traffic keeps it pretty busy. Kept in pretty good shape. I especially love the par 5's. They're all usually reachable in 2 from the white tees and give up many birdies. The par 3's on the other hand can be quite a challenge. 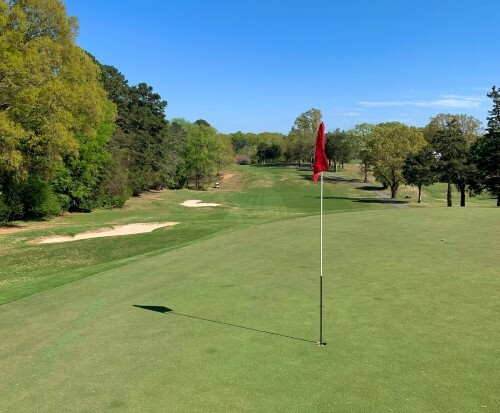 Hole #2 has a severely sloped green, #9 is a good 3-iron, #11 goes over a pond and #16 can play longer than #9 since it's uphill. I find the back 9 easier than the front. You should be able to score well if you can adjust to the greens. They are usually fast and have always been tricky for me to read. One word of caution that if you are not local or a frequent visitor to the club, you may not get a very welcome feeling. This course definitely caters to regulars.